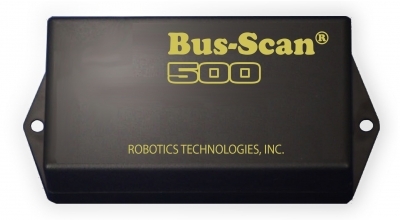 Bus-Scan - Robotics Technologies, Inc. Since 1995, the most stable and feature-rich product of its kind. We are the only company to offer wireless versions, for easiest installation. Quick and simple installation–no special tools or under-hood components. Uses vehicle horn or external-siren (siren purchased separately). Can control interior lights with optional module. Pluggable control harness, with built-in fuses. Communication port for feature expansion. Easiest and quickest installation. No need to run wires for the disarming switch. Just mount the included RF transmitter at the back of the vehicle, connect the Control Module and you’re ready. We are the only system to offer this convenient time- and money-saving feature. The Remote Transmitter automatically pairs with the Control Module with the touch of a button–no DIP switches to set! 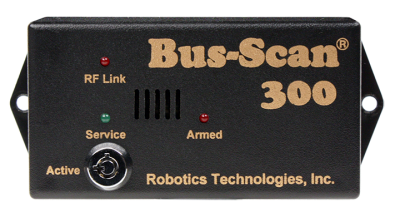 All the features of the Bus-Scan 300 RF, plus automatic Interior Light control to light the way to better inspections. Perfect for jurisdictions that require dome light activation during vehicle inspection. All the features of our Wireless version, only with direct wiring to the disarm switch. Economical! Exclusive wireless disarm buttons–saves time & cost! Easiest installation–can accept both positive and ground inputs for brake & doors. High-capacity Horn & Light relays built in. No external module needed. Easiest & quickest installation: No need to run wires for the disarming switch. Just mount the included RF Transmitter at the back of the vehicle, connect the Control Module, and you’re ready. 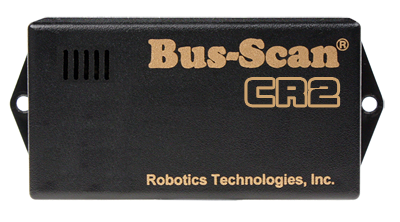 Bus-Scan is the only system to offer this convenient time- and money-saving feature. The Remote Transmitter automatically pairs with the Control Module with the touch of a button–no DIP switches to set! Ignored-horn fail-safe: Prevents battery drain if driver walks away. All the features of our Wireless version, only with direct wiring to the disarm switch.